Spent another night in the slu. 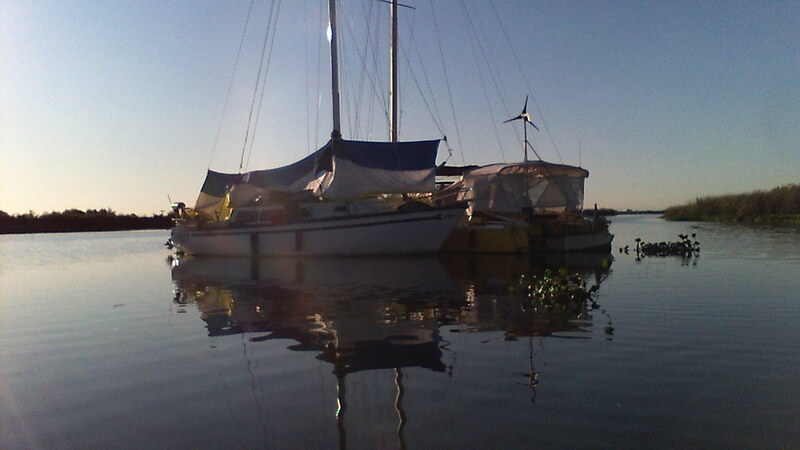 Beautiful stars but so much wind that the SPLAP SPLAP FWAP of the water hitting the transom kept us awake. I decided what it sounded like is a large angry fish wearing combat boots stomping up from the cellar, kicking the door a few times, and clomping back down, repeatedly. The wind kept away the bugs, thankfully. Side tied as we were to R who was hooked to a mooring ball, I didn’t worry a moment about drifting. Austin was able to move across both boats by himself. Even in the wee hours when I’m sure R would prefer to have been sleeping. Austin clicked his little toenails all over the catamaran. I didn’t realize cormorants like freshwater too. Out here they sound either like murmuring human voices or an active geiger counter up in the trees. This is in contrast to the egrets who sound a lot like chickens going to roost – except for the occasional irate one who sounds for all the world like it’s saying “GET OFF THE BOAT!” Eeery. 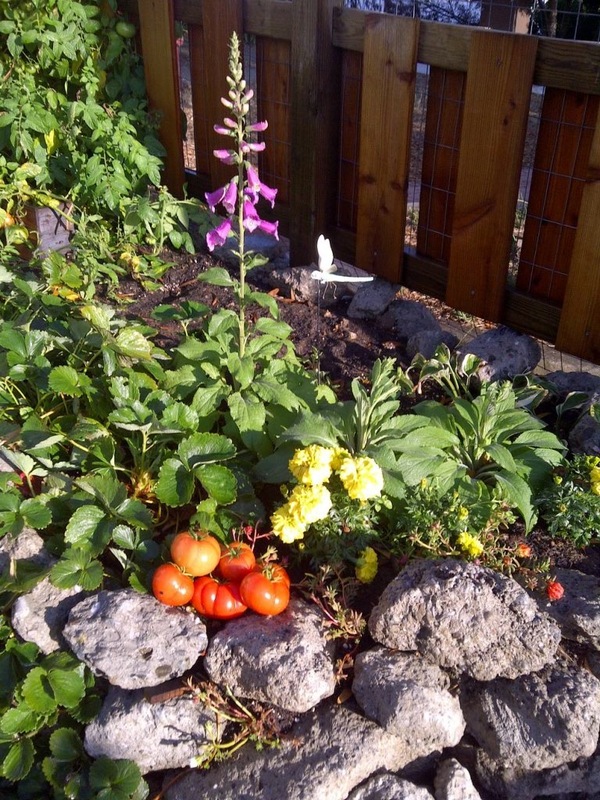 Donna sent a picture of how our Liveaboard Garden in Berkeley is doing. The water hyacinth were on the move. Someone must have hacked them up upstream because they marched down in a formidable colony and clogged the waterway. It was like an old asteroid invaders video game dodging the clumps. When I caught up with R he was surrounded and struggling with the heavy blossoms and squeaky leaves. Plus I got briefly stuck in the mud twice because I had not observed the low tide or the old levee that I tried to cross. Oops. It’s a learning curve. 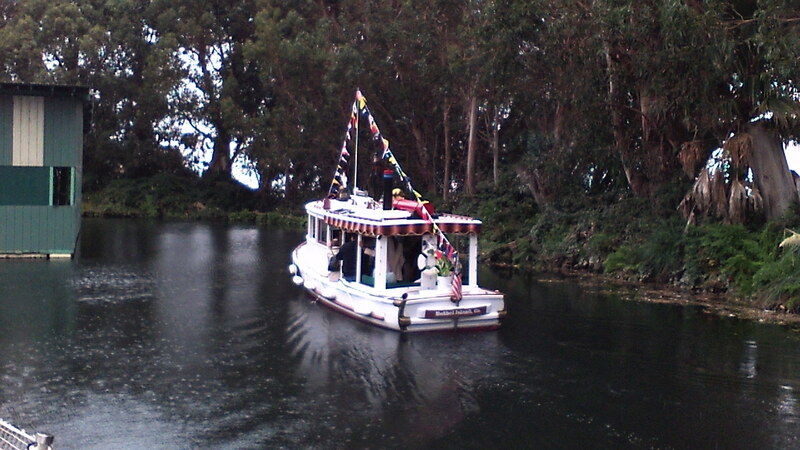 The steam boat parade was also on the move. One of the participants put put put putted into Korth’s a few days later. 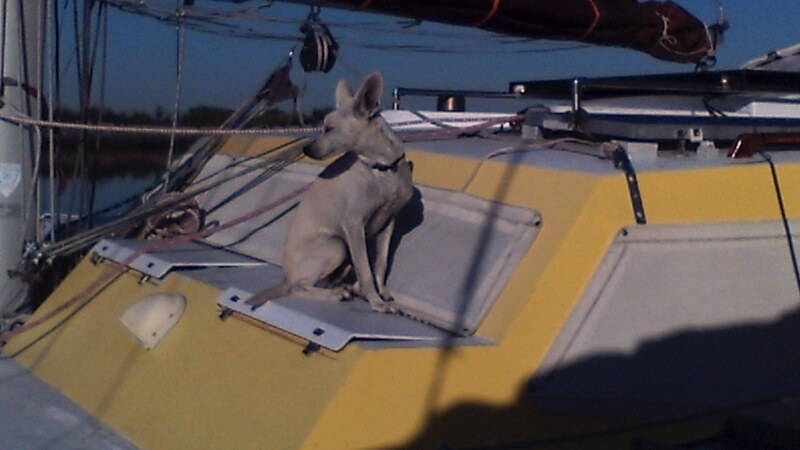 This entry was posted on Monday, September 26th, 2011 at 8:16 pm and is filed under Cruising Life. You can feed this entry. You can leave a response, or trackback from your own site.